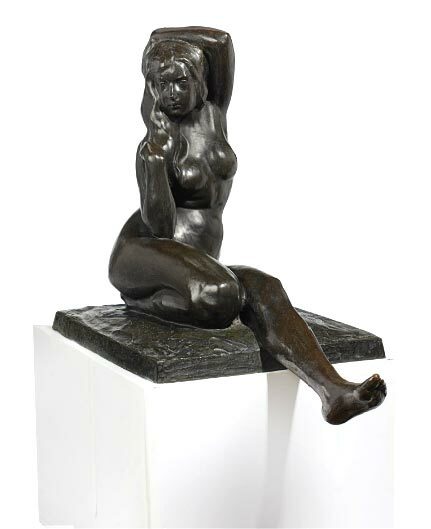 Christie’s New York sold The Private Collection of President and Mrs. Ronald Reagan, September 21-22, 2016, with total sales of $5,740,625, far surpassing the total high estimates. I wish I had known about the sale in advance, but unfortunately I missed it. I would have loved to own a souvenir of President Reagan, but realistically I probably wouldn’t have been willing to pay the high prices. 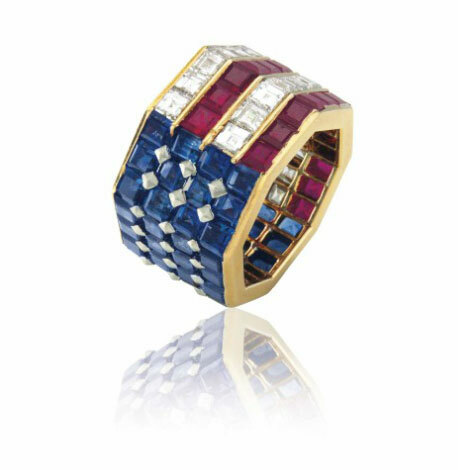 The top lot of the sale, #126, a Bulgari diamond, sapphire and ruby ring, in the motif of an American flag, was owned and worn by the first lady. The final price of $319,500 made a mockery of the pre-sale estimate of $5,000 – $7,000. 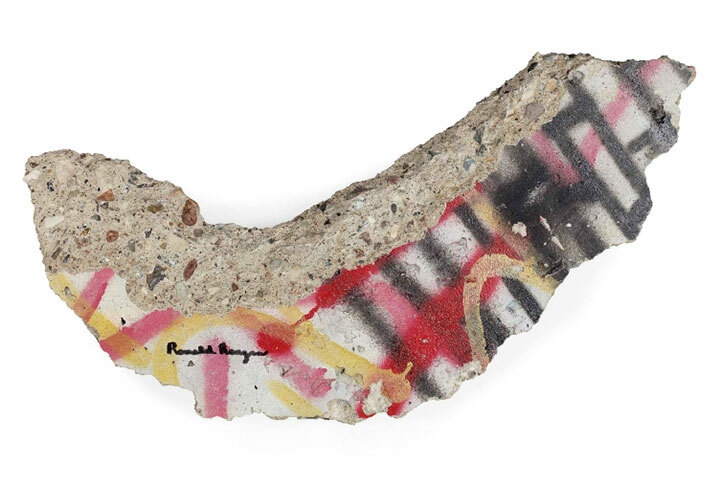 The second highest lot of the sale was the most interesting and historically significant — a graffiti-covered piece of the Berlin wall, hand-signed by the president. One of Reagan’s most famous quotes, from a speech he made in West Berlin on June 12, 1987, was “Mr. Gorbachev, tear down this wall!” It too, far exceeded its high estimate of $20,000, realizing $277,500, including buyer’s premium. It should have brought even more. 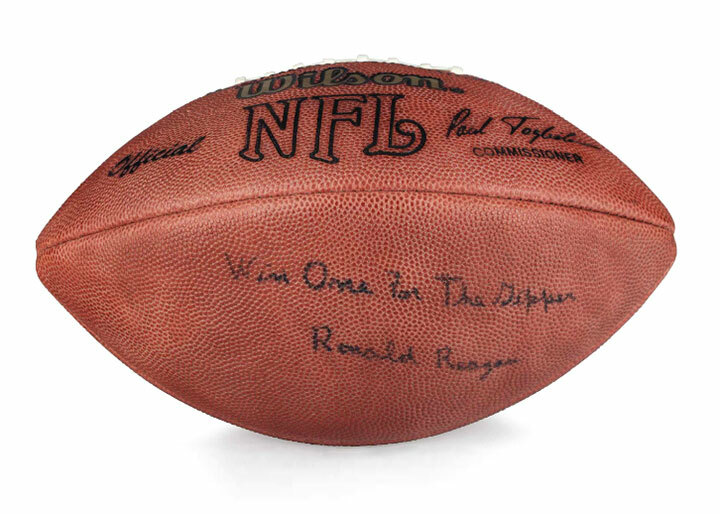 Another very cool lot from the sale, #100, was an official NFL Wilson football, signed and inscribed by Reagan, “Win One For the Gipper Ronald Reagan”, in its original box. It’s a paraphrase from his 1940 film, Knute Rockne, All American. No trouble again with the pre-sale estimate of $5,000 – $10,000. This one scored a touchdown at $93,750, including buyer’s premium. If you had to have something from the sale as a souvenir, you could have bought lots 414 or 415 for as little as $750, but they were pretty boring. For the complete results of the sale, click here. 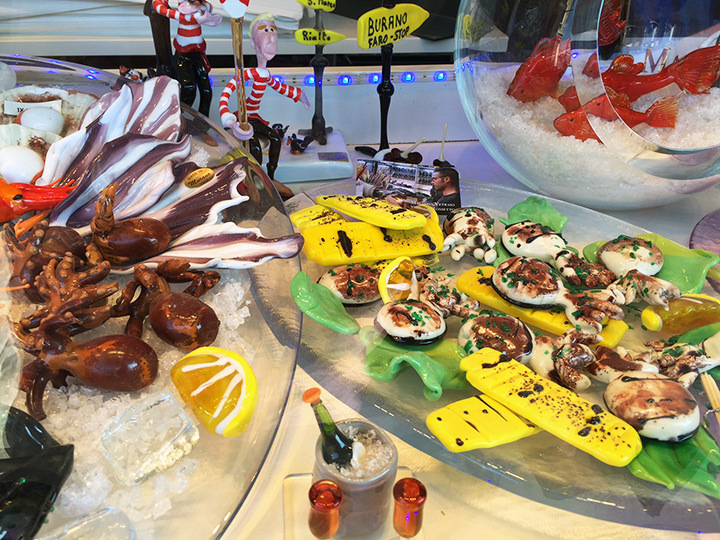 I hope to put together videos of the glassblowing demonstration we saw in Murano, Italy, for uploading to youtube for this Thursday’s post, but I don’t guarantee it. 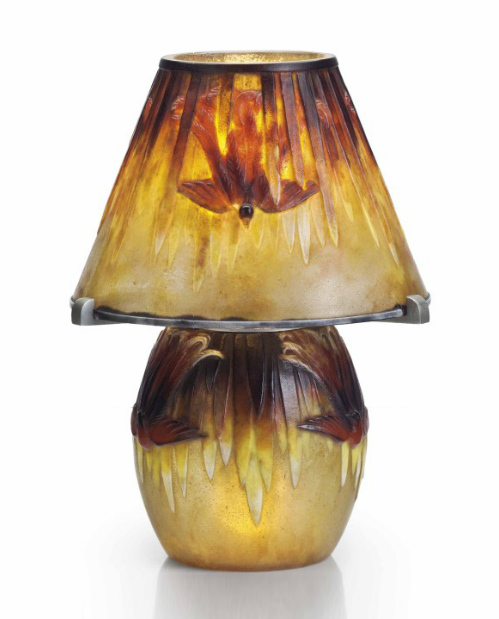 You’ll want to see it if the process of glassblowing interests you. 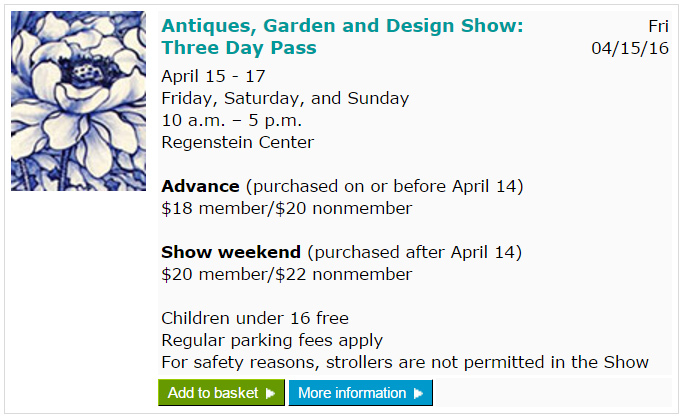 Our next show will be in Winnetka, Illinois, November 4-6, 2016. This is our only fall show in the greater Chicago area (and probably our last show of the year). We always look forward to exhibiting there, especially to see all our friends and clients. Put it in your calendar. It’s a lovely show! 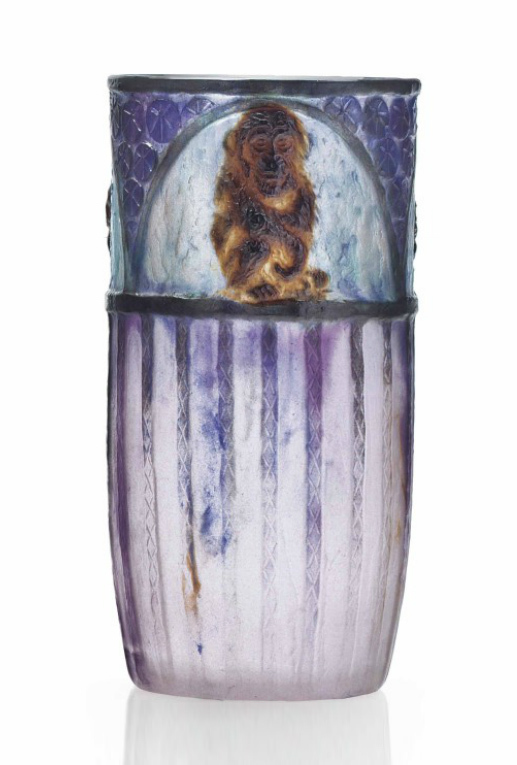 Christie’s South Kensington held their Interiors sale yesterday, September 14, 2016, with total sales of £764,688 ($1,009,329). 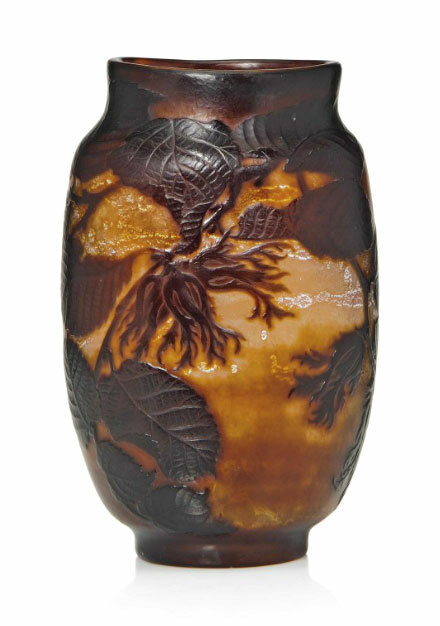 Included in the sale were about twenty French cameo vases. I probably would have bought a few of them, but unfortunately I missed the sale. 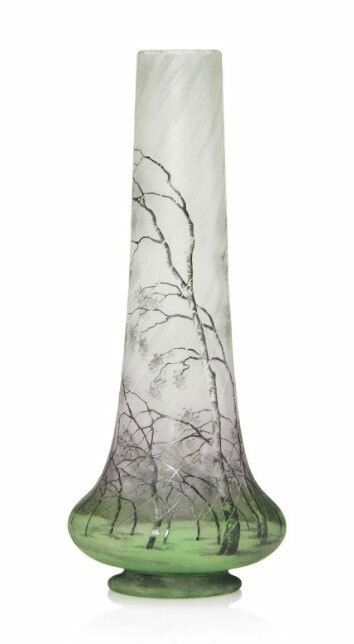 Lot #201 was a nice Daum Nancy 8½” Rain scenic vase. It exceeded its pre-sale estimate of £3,000 – £5,000, realizing £6,875 ($9,151). 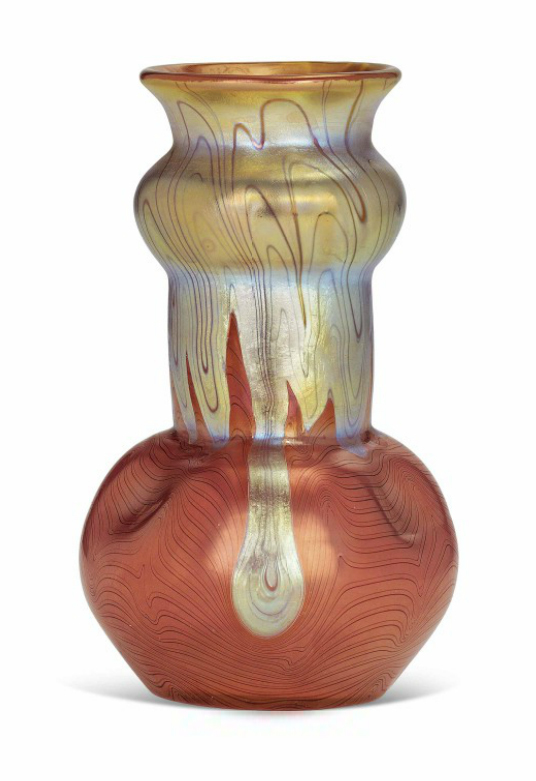 The top lot of the Daum Nancy selection of glass was #139, a huge 19¾” vase, with nice coloration and very fine martelé work in the background. 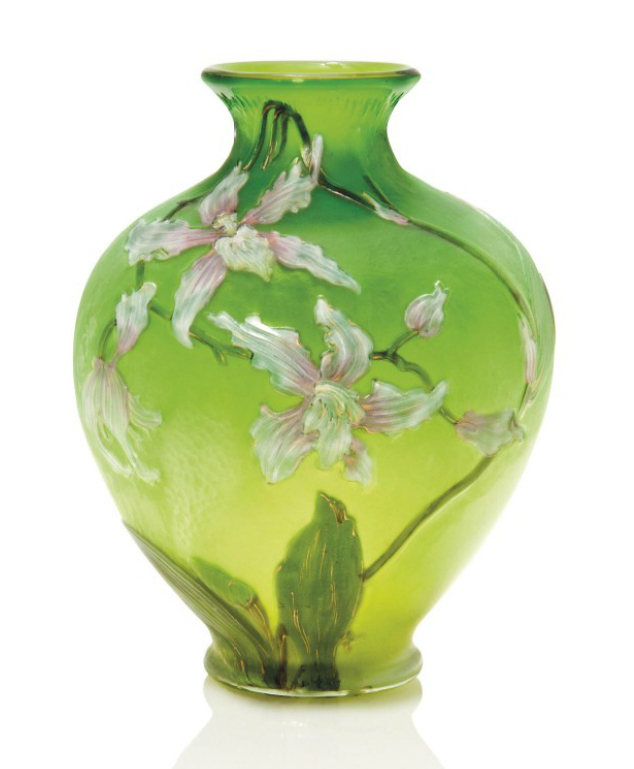 I’ve had similar vases in the past, which were superior to this example, in my opinion. I didn’t like the carving on the foot as it looked too haphazard, like the carver was trying to eliminate flaws in the making. It was all original, but not to my taste. 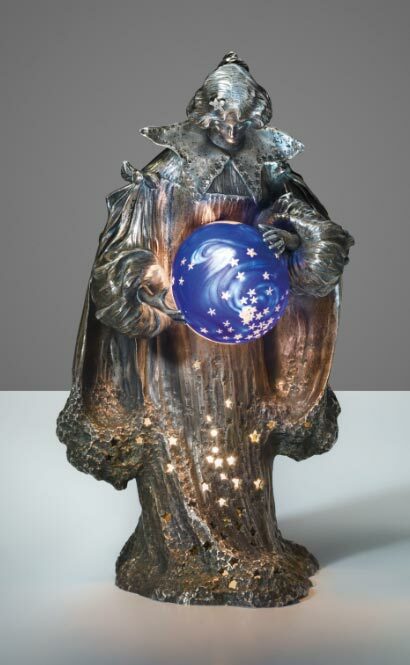 Regardless, it exceeded its high estimate of £6,000, realizing £7,500, ($9,982). 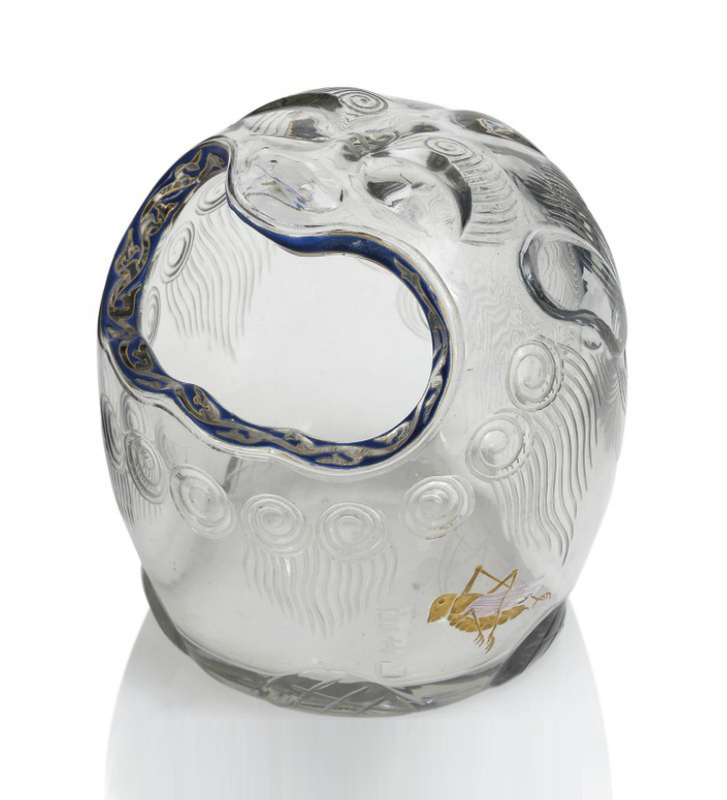 Top lot of the Gallé glass was #138, a Hazelnut vase with internal decoration, called intercalaire. 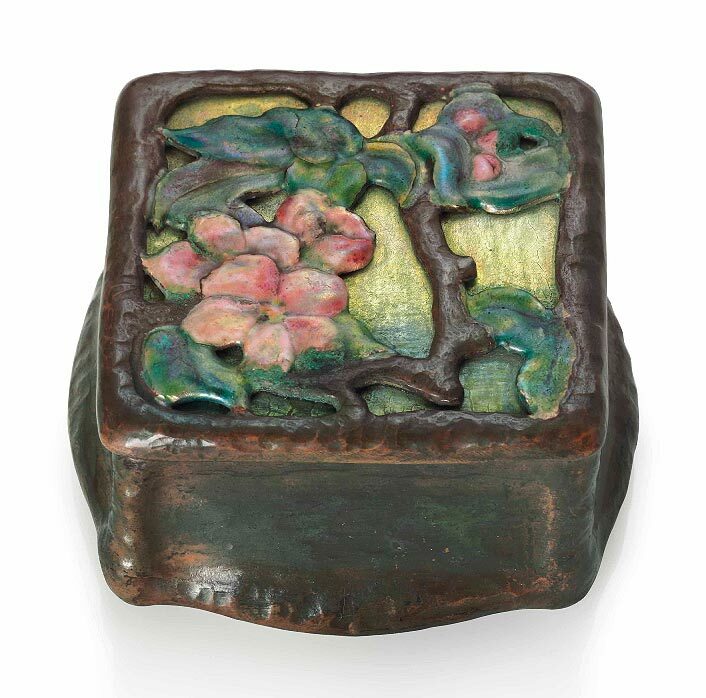 Brown is not usually a desirable color, but the high-quality workmanship, including wheel-carving, was attractive to bidders. 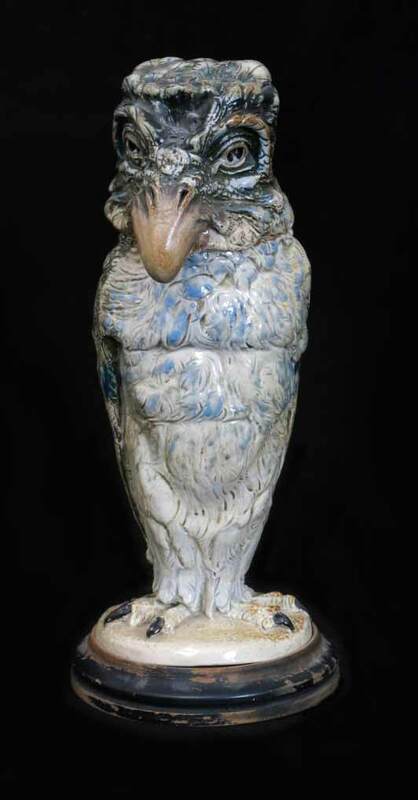 It sold over its high estimate of £6,000, realizing £8,750 ($11,646). I didn’t like it, so I wasn’t going to bid, no matter what the price. 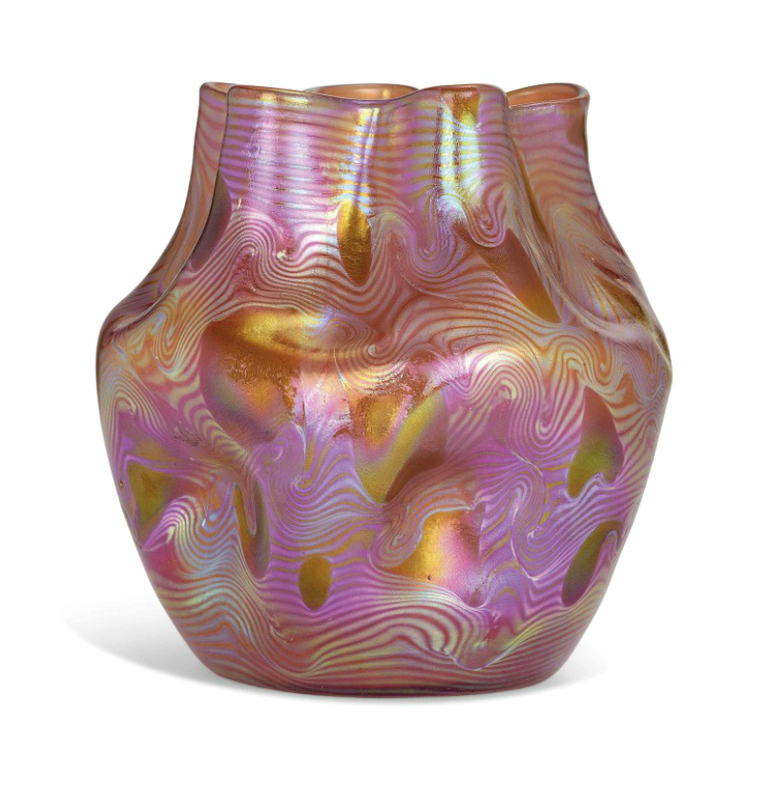 Our next show will be in Winnetka, Illinois, November 4-6, 2016. This is our only fall show in the greater Chicago area. We always look forward to exhibiting there, especially to see all our friends and clients. Put it in your calendar. It’s a lovely show! 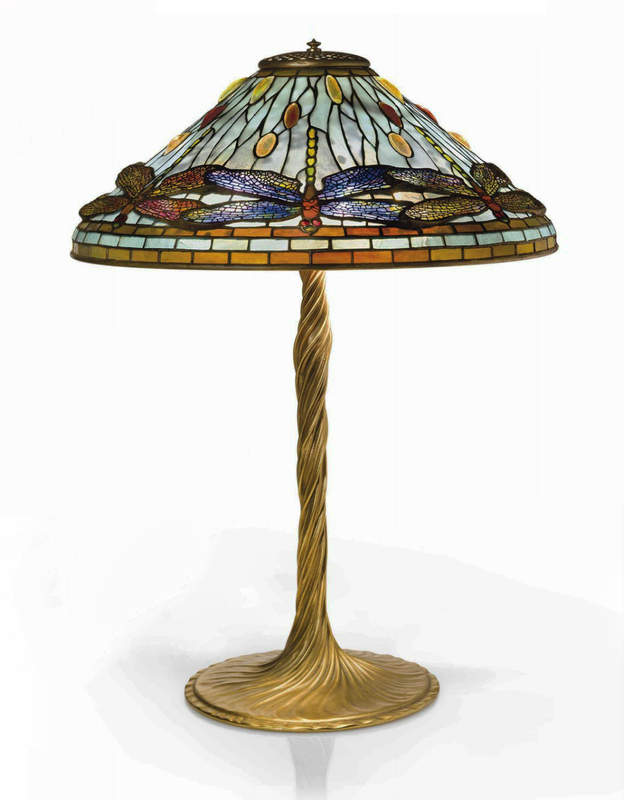 Christie’s New York held their Design sale on December 18, 2015 with total sales of $5,169,125 for the 152-lot auction. 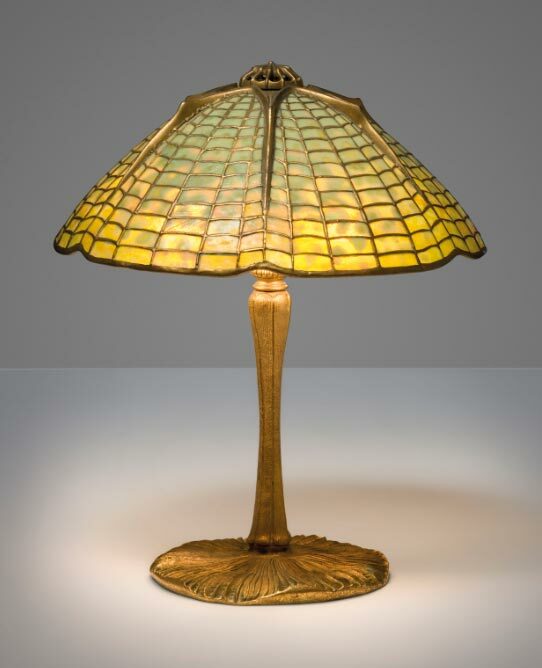 The first 36 lots of the sale were Tiffany Studios items. 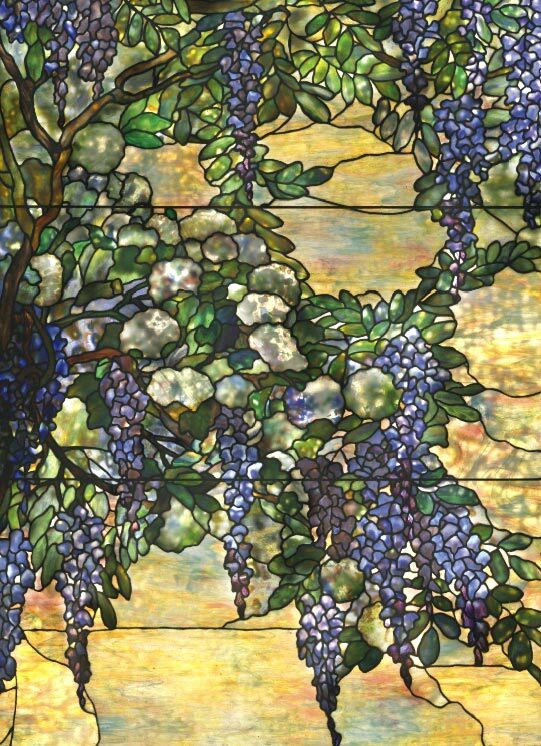 10 of those failed to sell, which worked out to a total of $1,378,500 for the Tiffany, for an average of $53,019 for the 26 sold lots, considerably below the results of Sotheby’s Tiffany sale two days earlier. 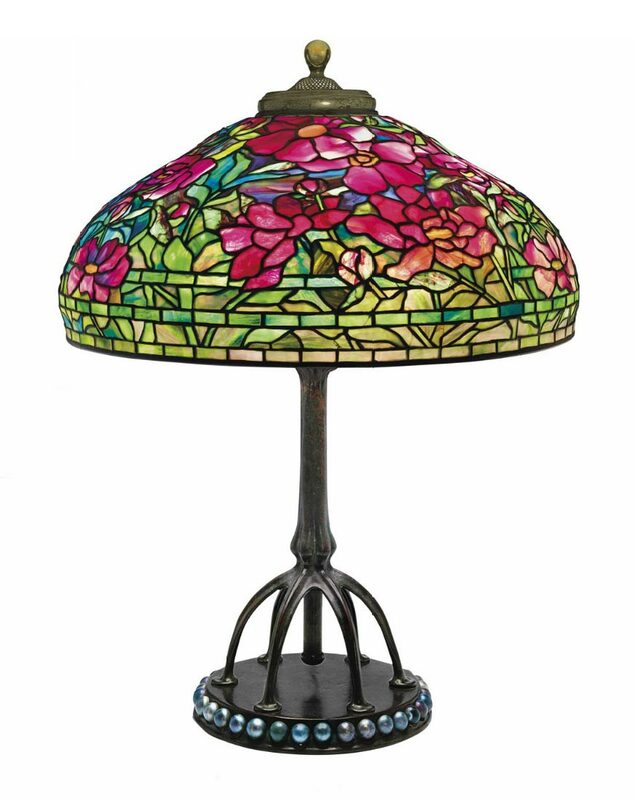 Top lot of the Tiffany portion of the sale was #318, a Tiffany Studios 22″ diameter Peony table lamp, with a rare Favrile glass ball base. It sold below its pre-sale estimate of $180,000 – $240,000, realizing $173,000, including buyer’s premium. 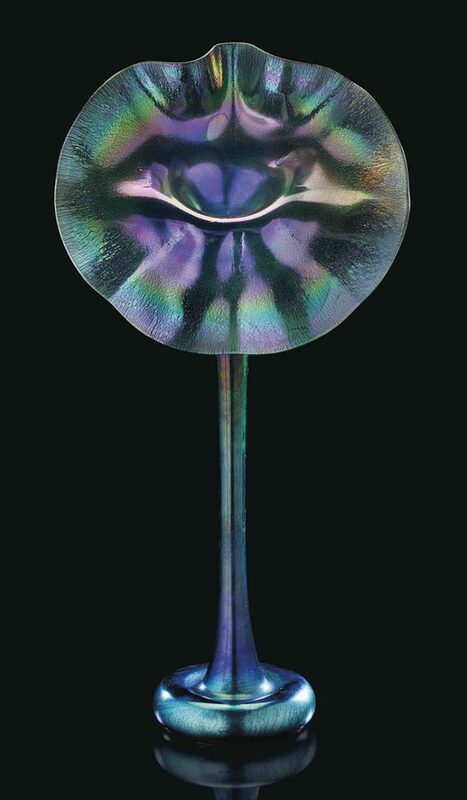 Oops on my prediction that the Christie’s blue Favrile Jack-in-the-Pulpit vase would bring less money than the example at Sotheby’s. 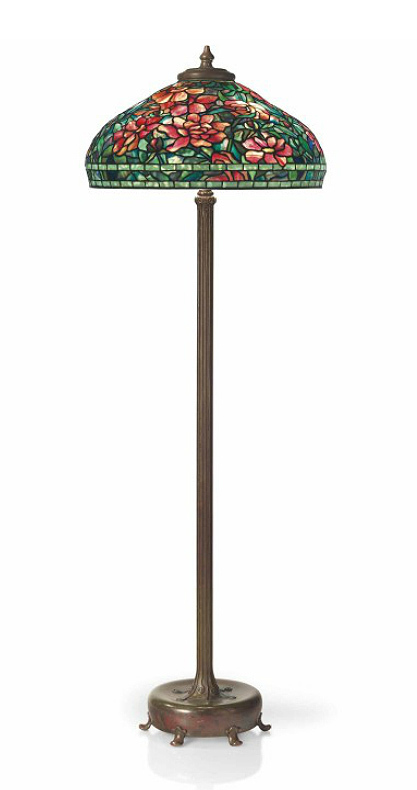 Christie’s Jack, lot #311, sold for an incredible $161,000, including buyer’s premium, against a pre-sale estimate of $80,000 – $120,000. 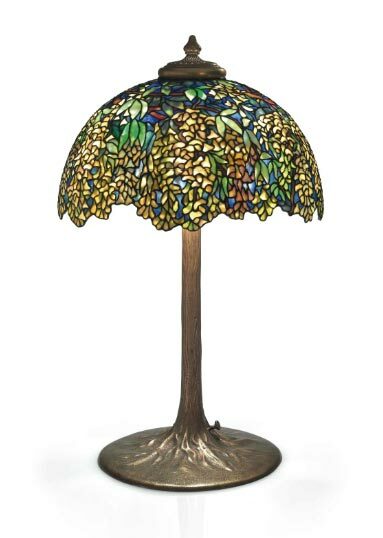 That was $42,250 more than the $118,750 spent on the Sotheby’s example. I thought the color on the Sotheby’s example was much better than Christie’s, but Christie’s example was bigger by 2″, 21¼” versus 19¼”. That worked out to $21,125 per extra inch. Whew! 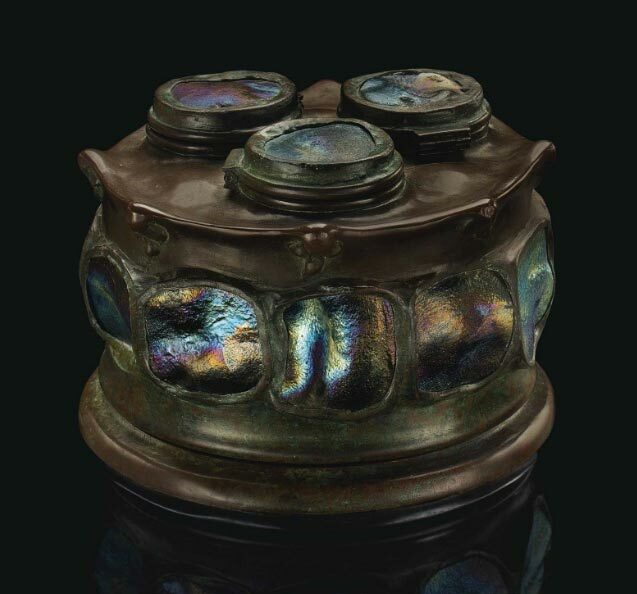 Lot #317 was a rare Tiffany Studios Turtleback triple inkwell. It also sold below its estimate of $30,000 – $50,000, realizing $25,000, including buyer’s premium. 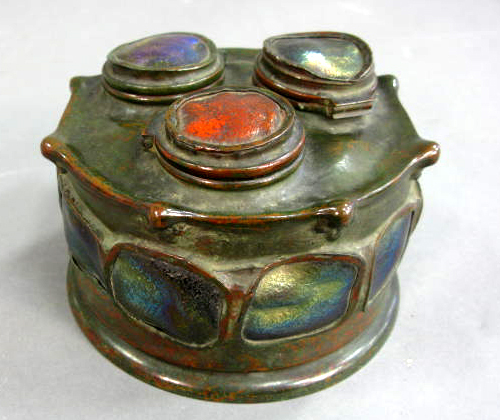 This is only the second time I’ve seen this inkwell come up for sale at auction. 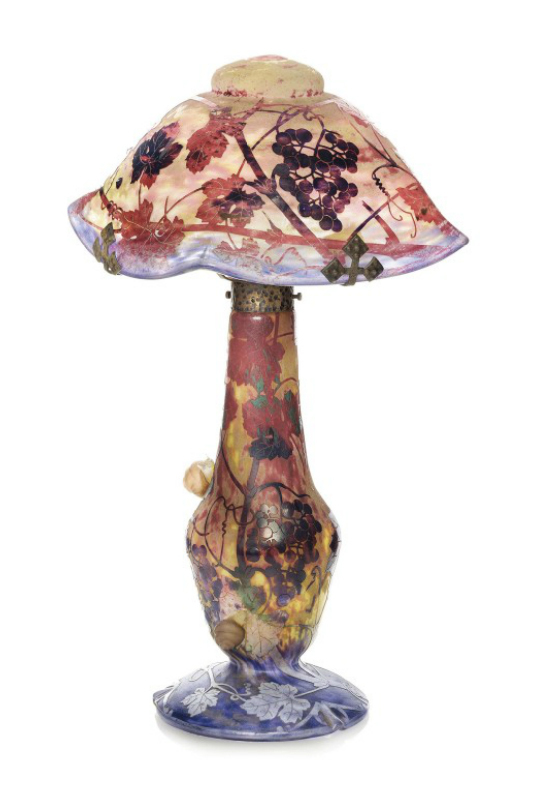 A far better example sold at Nadeau’s Auction Gallery, Windsor, Connecticut, on October, 30, 2010, for $37,500. 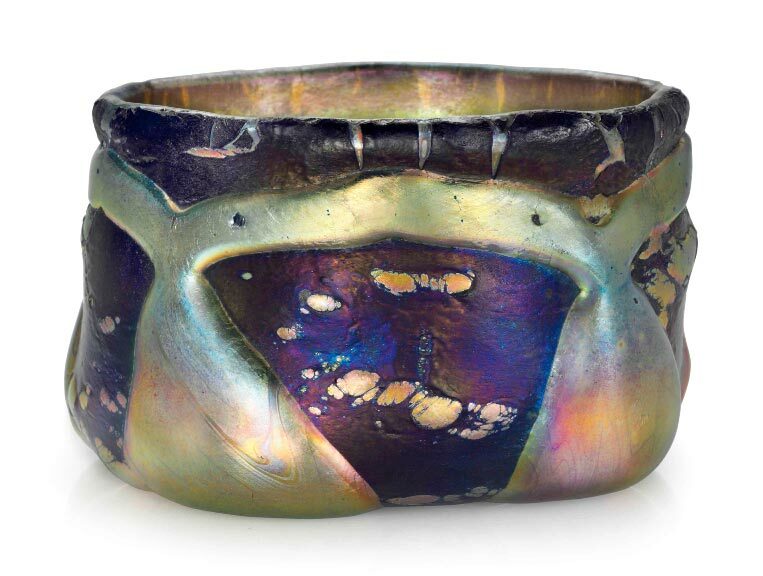 It had three distinct colors, red, blue and green and a much better patina. 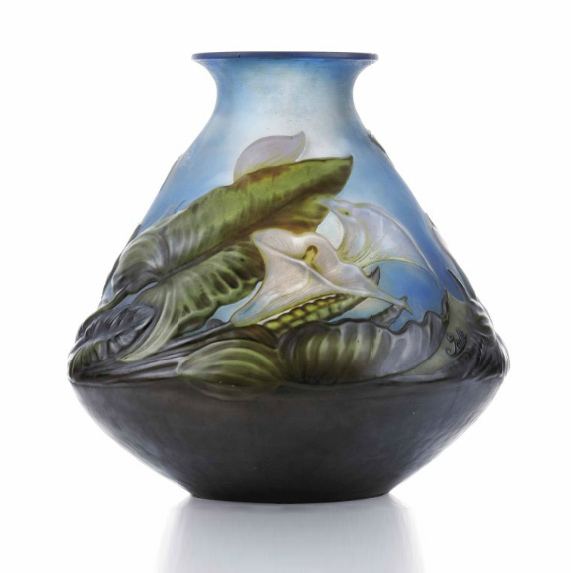 It’s my understanding that the dealer who bought it subsequently sold it for $75,000.